Southern California is expected to receive moderate to heavy rain this week. Since rain will likely begin during Tuesday’s evening commute and continue through Thursday, according to weather forecasters, the Automobile Club of Southern California urges Southland drivers to buckle up, slow down and allow extra time and space between vehicles. Flash flooding and significant debris flows are also possible in the recent fire-burned areas, according to the weather service. Windshield wipers should be used while driving in the rain as well, and replaced before the rain if needed. The Auto Club also reminds motorists to turn on their vehicle headlights so they can see and be seen by other drivers, she added. California law requires that if drivers’ windshield wipers are running, their headlights must be turned on. Don’t brake directly over a pothole. Applying brakes at this moment causes the car’s weight to shift to the front of the vehicle and can increase damage from the impact. Use headlights and windshield defroster. Driving in rain means reduced visibility. 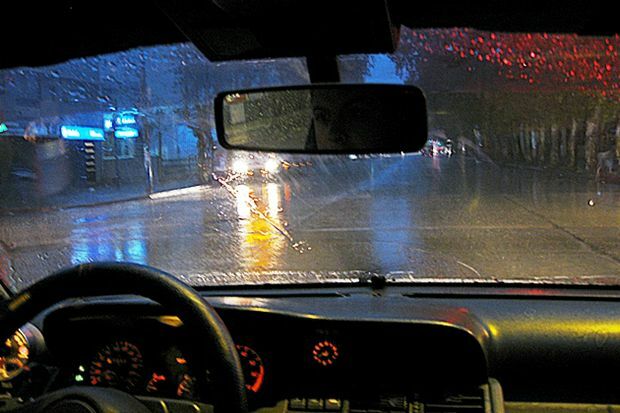 The Auto Club recommends that motorists turn on the vehicle's headlights so they can see and be seen. Besides, the law in California requires that your headlights must be on if the windshield wipers are in use. Turning on the defroster helps keep the inside of the windshield clear of moisture.